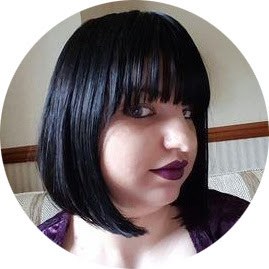 I am so sorry that I didn't post yesterday, I felt/ feel pretty rubbish so toady you will get TWO posts from me to catch up. Arn't you lucky people? Harry Potter and the Order of the Phoenix is the longest book of the series. Did it need to be so long? No. It has some fantastic parts. The end is one of the best endings (and saddest) of any of the books in the series. But it just gets bogged down on some parts which are not needed. Point and case super emo Harry. But even so, I do still love this book. Anyway, The novel features Harry Potter's struggles through his fifth year at Hogwarts School of Witchcraft and Wizardry, including the surreptitious return of the antagonist Lord Voldemort, O.W.L. exams, and an obstructive Ministry of Magic. 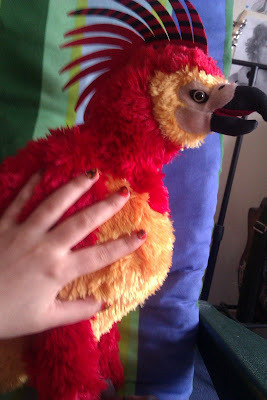 That's right feathers! 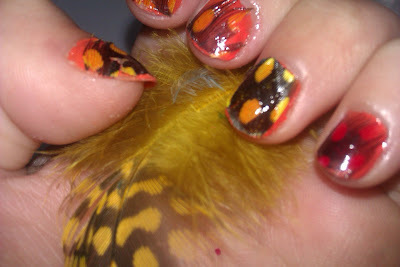 I used a base coat of a unnamed orange creme 2True polish and then a coat of SV and then stuck down the feathers and then applied another coat of SV to make it smooth. 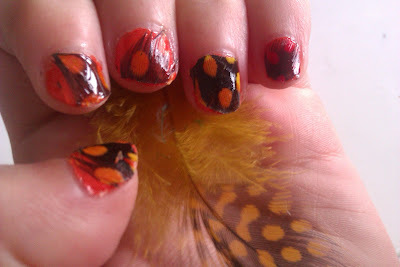 These spotty feathers were perfect for Fawkes, I used the Red, Orange and Yellow ones. I couldn't get the feathers to sit perfectly flat on the nail which is a bit annoying but they stayed on for a day. I am going to go now and have a nap and then i will be back with Half-Blood Prince. I love that you have a Fawkes plush!! How cute!